Lisa Scott became a member of the Indianapolis Symphony Orchestra in 1983. Born in New York City, she grew up in Bloomington, Indiana. Ms. Scott earned a B.M. degree from Indiana University, where she studied with Tadeusz Wronski, Jacques Israelievitch and Daniel Guilet. She participated in master classes at the Banff School of Fine Arts and with the Rowe Quartet in Switzerland. Ms. Scott has appeared twice as soloist with the ISO and served as a section coach for the Side by Side program. She is married to ISO cellist Perry Scott, and they are the parents of two sons. 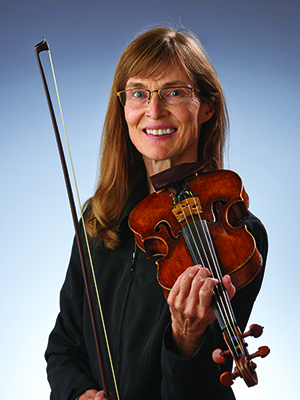 The Scotts, along with ISO violist Beverly Scott and his wife, formed the Scott Chamber Players in 1981 and are the piano quartet in residence at the Indianapolis Museum of Art. Ms. Scott is a recognized visual artist in the pen and ink medium.